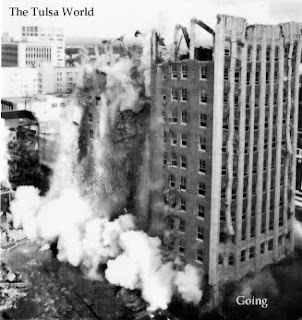 After World War II ended, the temporary moratorium on domestic housing construction was lifted. As the soldiers returned home, new housing was in great demand. The government VA loans helped to increase housing production which led to the growth of suburban areas and the move out of the inner city. 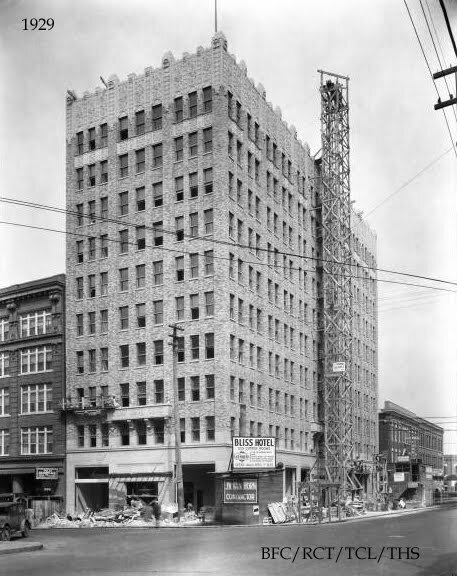 Congress responded with the Housing Act of 1949 which authorized funds to localities to assist in slum clearance and emphasized new construction. 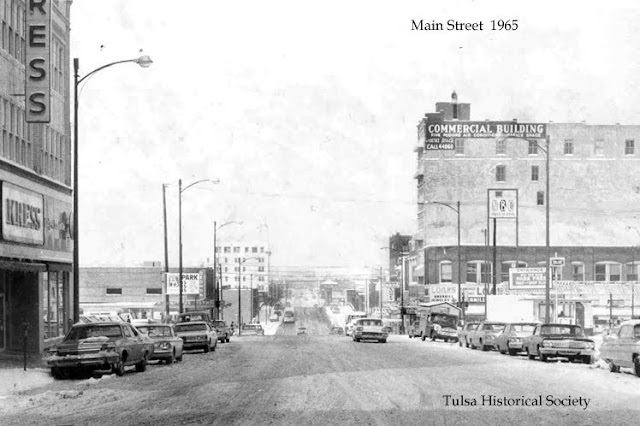 Tulsa was the first large city in Oklahoma to form an urban renewal authority in July, 1959. 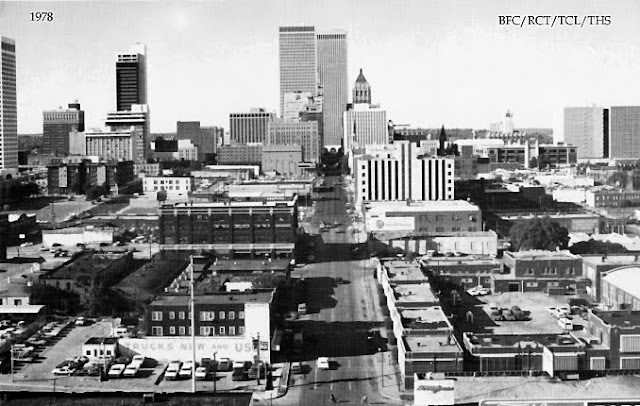 After the first Oklahoma project - Seminole Hills - was completed in 1968, Tulsa initiated a downtown urban renewal program, declaring the heart of the city "blighted". Use of condemnation by eminent domain allowed the city to acquire 9 city blocks and clear dozens of properties to make way for a new office complex anchored by the Williams Center. 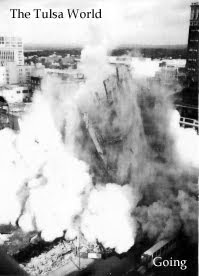 In the past the wrecking ball had been fairly selective in which buildings were taken down and why. 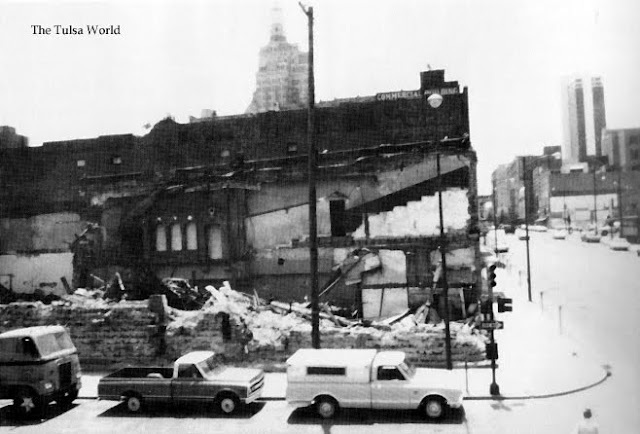 Now the city's heart, where it all started, was reduced to rubble, clearing the way for what was hoped to be a revitalized downtown. 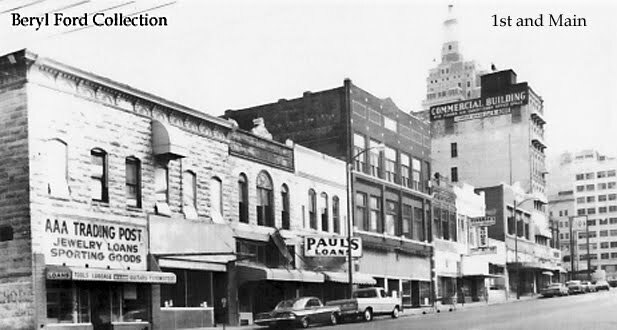 Lost in this was The Grand Opera House, the Lynch building which was Tulsa's oldest standing building and Tulsa's first bank. 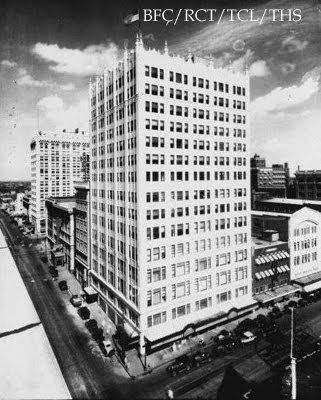 The Commercial Building was once a city pride, back in the early oil days, as were the Brady and Tulsa Hotels. Granted, these buildings were all sagging and weathered. If they weren't abandoned, they were used as Pawn or Loan shops. They were eyesores, to be sure. 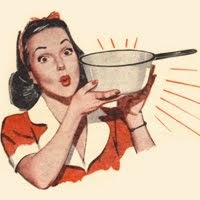 And at this time, in the late 1960's and early 1970's, what was being done was in the name of Progress. 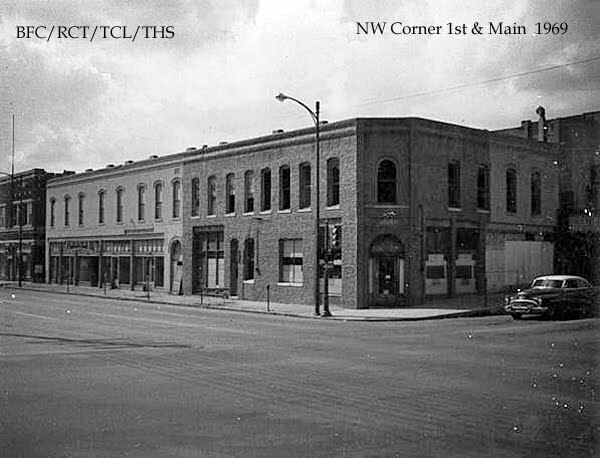 This is the SW corner of 1st and Main 1969. This was the Hall Store that he built in 1909. 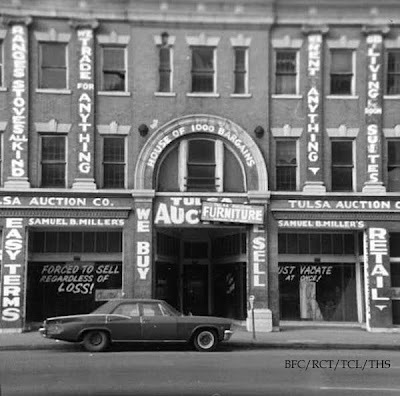 And this was the Archer Building, also on Main. The Grand Opera House opened in 1906 and was where the elite gathered. In it's last years it was used as an auction house. 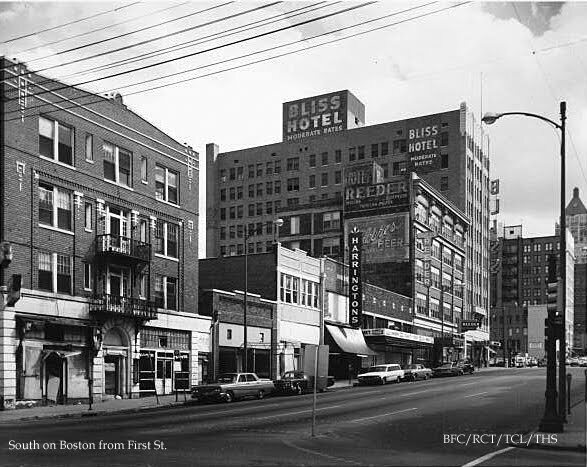 On Boston you can see the Browning Hotel, Uncle Willie's Donuts, Harrington's, Reeder Cafe, and the Bliss Hotel. most of whose homes had been bulldozed by urban renewal. The Medical Arts Building sat at 6th and Boulder. 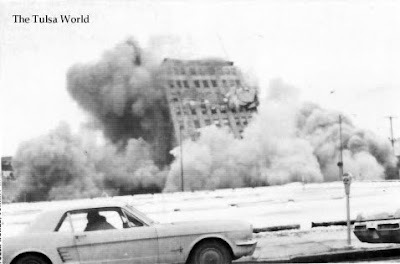 When the old Lynch Building came down there wasn't even a crowd-pleasing implosion. 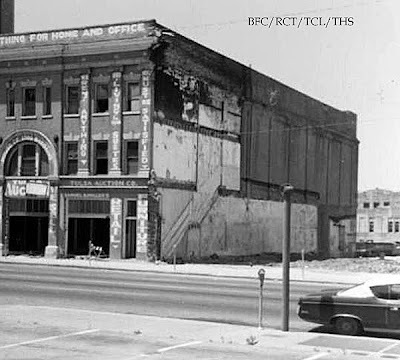 The building housed one of Tulsa's first movie theaters, The Lyric. As the 2-foot thick walls of hand-cut stone crumbled down, one could see a bit of the balcony and decorative fake windows. 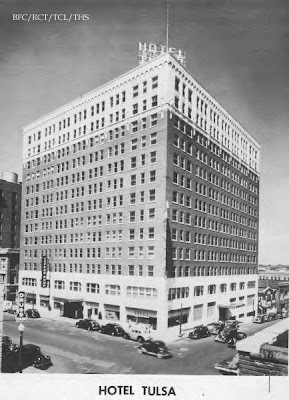 The Hotel Brady 24 N. Main sat empty for 30 years. It finally came down in 1970. 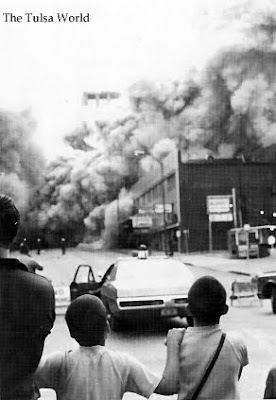 This photo was taken in 1973 during the transition. Smaller towns refused urban renewal which is why many of their historic areas are still standing. Very interesting. 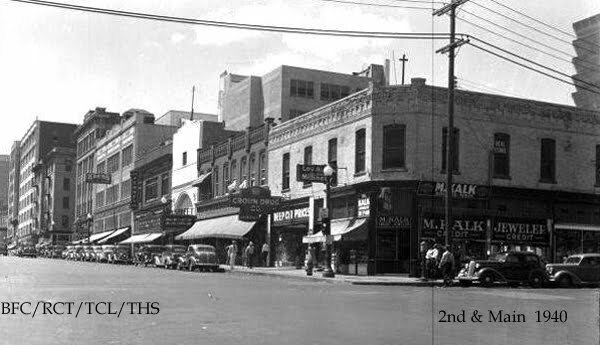 I've seen other pictures of some of the buildings before urban renewal. I'm not sure what the the best thing is. Somewhow repurposing buildings would seem to make the most sense. The Williams center is nice but forgettable. Basically a scale model of the World Trade Center. Pretty lame. Lots of interesting photos. In some places there is the inclination to remodel historic building to at least preserve the facade. It seems that handsome buildings fall into such disrepair that the cost of bringing them up to modern standards is just prohibitive. It looked for awhile that the Mayo was going to fall in that category. 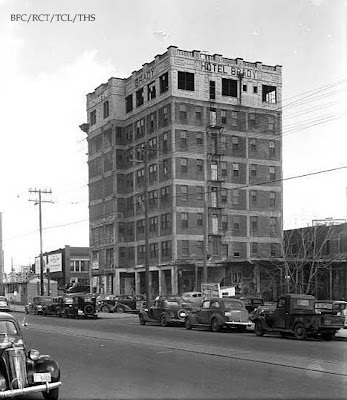 Tulsa has managed to hang onto some of its historic buildings. Tulsa Central and the Frisco Depot being good examples. Nice post Nancy. Thanks. Sometimes I can't decide which is sadder: the buildings when they are vacant and rundown or as they're being demolished. I guess it makes us appreciate the historical buildings that have survived and are being used even more. Funny someone should say "Scale model of the WTC"... The BOK tower is by the same architect, and is the tallest still standing, though not the most distinctive of his skyscraper designs. I think Seattle's Ranier Tower has that distinction, though his design for the Darhan(sp?) International Airport in Saudi Arabia is beautiful. 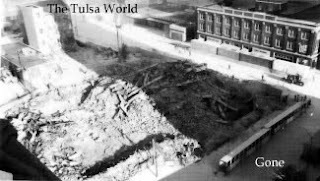 MaurcusD~ I wonder why they dont have any pictures depicting the damage that urban renewal caused to the Greenwood District? Duncan McIntyre: "Father of Tulsa Aviation"